Purchased 2017 Ram 1500 Maribel was great as was the GM. No pressure. Very professional. I highly recommend. They made the whole process very easy. They also included a detail that was completed after the purchase. "Very responsive and healpful from beginning to end." Jason was very responsive to my email questions from the first contact through eventual purchase of vehicle. He answered all questions, and seemed to really care about making sure I was comfortable with the condition of the vehcile prior to making the 2 hour drive to Gainesville to see the vehicle. Once on the lot it was apparent that this was not some pop-up car dealership with a few old cars. The dealership was clean and had a lot of really nice cars. This made me a little more comfortable about dealing with them. 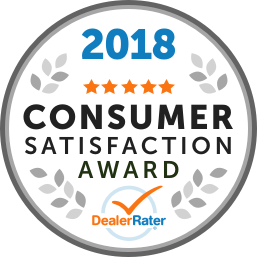 Buying a used vehicle is fairly stressful in itself, but Jason and his team were more than helpful while I took the vehicle through test drive and look over. I was a little apprehensive about the vehicle, because it really seemed to be too nice for the price..especially since they were willing to give me an even better deal once I was there. I have had the vehicle now for over a month and I am very satisfied with the purchase. "False Advertising, Deceptive Sales Practices"
Negotiated deal with Sergio Coreno via phone. Purchased 2017 Toyota Tacoma on 12/9/17 for my son for Christmas. Vehicle was dealer transfer from Lawrenceville location. Paid CASH $37,775. Vehicle advertised and sold with 2 key fobs. David, salesman and Arlet, F&I said couldn't release 2nd key fob until check cleared. Check cleared 12/13/17 and still no 2nd key fob. Keep getting run around from salesman and F&I manager refuses to call back! Marcela was a great sales advisor! She was was accommodating, knowledgeable, and personable. Highly recommend checking out Auto Gallery and be sure to ask for Marcela! Quality and price are just right. Service was excellent and sale person was great. This is are Fifth car from them . I have never had and problems with any of the car's from them. Thank you Mrs. Acosta and MR. Sergio Coreno. I loved it! Best treatment. Sweet person. Helpful. Lovely. Recommended!!! I loved my car. Perfect! Thank you Marcela! She the best saleswoman and person. Congratulations!!! Marcela knew from the moment I walked in that I was determined to buy the car I wanted, and she’s enough she, along with everyone else made sure I walked out with my car! Everyone went above and beyond when helping me with my purchase and I couldn’t have asked for anything more! I recommend Marcela and Auto Gallery 100% to anyone buying a car!